Exhilaration is a common feeling after a busy ski day – but you might also feel a little stiff if it’s been a while since your last snow adventure. Solution? 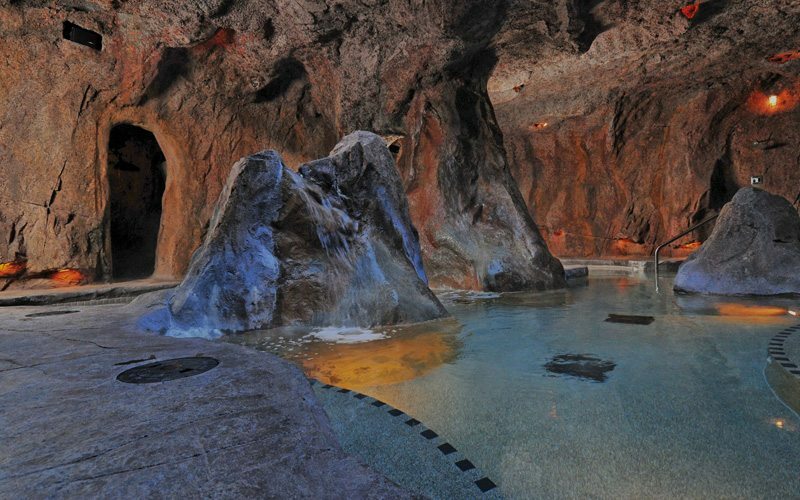 Soak those muscles calm at the best local hot pools! 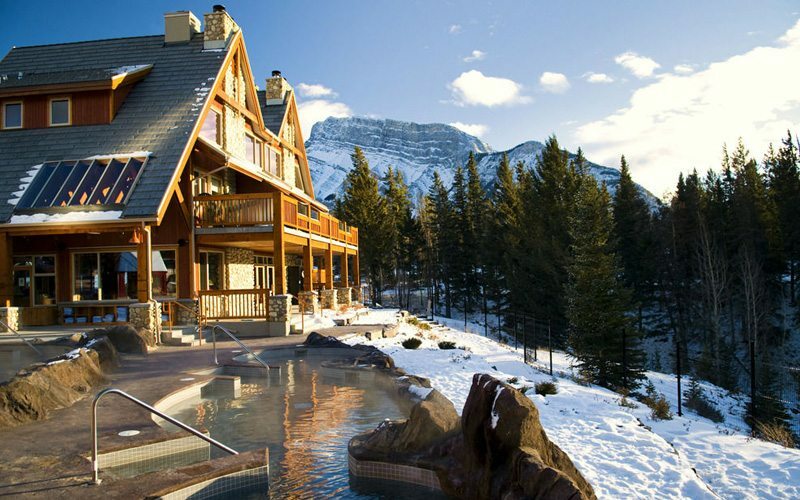 Here are our insider picks for the best post-slopes soaks in Banff & Lake Louise. 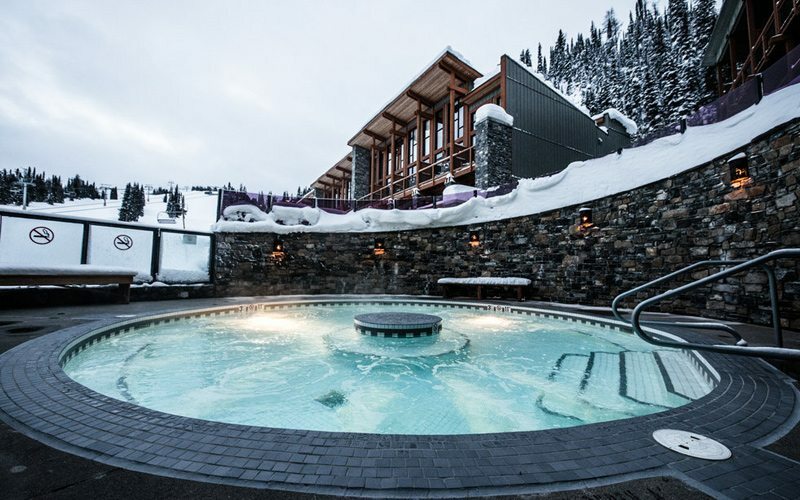 You'll find a variety of luxurious hot pools in Banff and Lake Louise, including the Fox Hotel's hot pool grotto. Photo: Fox Hotel. 1. 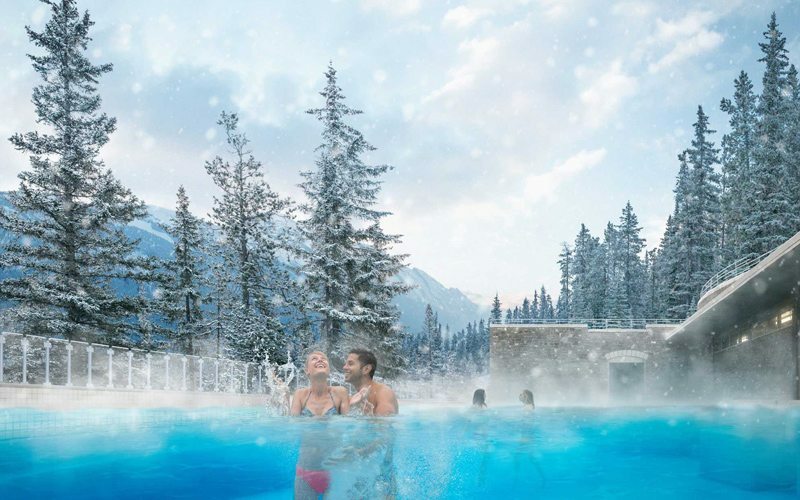 Immerse yourself in steamy hot mineral water and spectacular mountain views at the Banff Upper Hot Springs. Rent a retro bathing suit if you’d like to take the fun up a notch, then enjoy in the views across the valley to Mt Rundle. Insider tips: When you book a Ski Big 3 lift ticket for three or more days, you receive free access to the Upper Hot Springs. If you’re keen to avoid the crowds at this popular tourist spot, do as the locals do – come in the morning for the most relaxing visit. 2. For a truly unique way to relax, wade into Fox Hotel’s award-winning hot pool grotto. 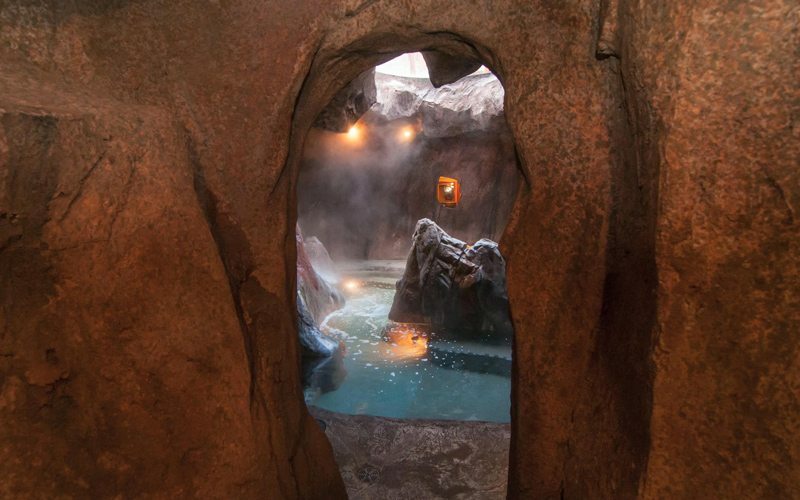 Set in a faux-cave and modelled after Banff’s famous Cave & Basin historical site – the natural thermal mineral springs on which Banff National Park was founded – you won’t find a hot pool like this anywhere else. Insider tip: there’s a common misconception that the Cave & Basin historical site is available for swimming or bathing. This isn’t the case – so it’s great to know that the Fox’s hot pool is such an excellent replica! 3. Kick back and relax in style at the Moose Hotel & Suites in two rooftop hot pools with spectacular views of the Canadian Rocky Mountains. Want the option of a relaxing soak indoors, too? The Moose also offers an indoor swimming pool and sauna. Insider tip: make the most of the fantastic outdoor rooftop hot pools by enjoying them at night while star gazing. 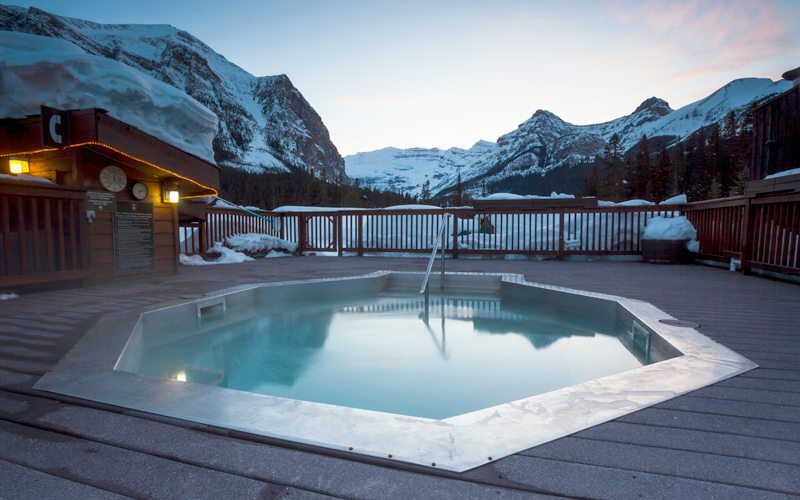 Take in the spectacular views of the Canadian Rocky Mountains at the Moose Hotel & Suites' rooftop hot pools. Photo: @loriiguillot on Instagram. 4. For an upscale experience like no other, the fairytale-beautiful Fairmont Banff Springs – known as ‘The Castle in the Rockies’ – is unmissable. Enjoy the outdoor hot pool with amazing 180 degree views down the Bow Valley, framed by Mt Rundle and Tunnel Mountain. Insider tip: for the ultimate indulgence, invest in a treatment at the hotel’s Willow Stream Spa – in addition to your selected spa experience, you receive access to the tranquility of three waterfall treatment pools, an indoor European styled mineral pool, and a private outdoor whirlpool. A visit to the legendary Willow Stream Spa is truly special. Photo: Fairmont Banff Springs. 5. For some of the best poolside views in Banff National Park, be sure to visit the hot pool at the gorgeously rustic Deer Lodge in Lake Louise. With unimpeded views of the Victoria Glacier, bathe in the moonlight from this pristine rooftop sanctuary. This historic location is a perfect respite after a busy day on the slopes at Lake Louise Ski Resort. The outdoor hot pool at Deer Lodge is an excellent choice after a day at Lake Louise Ski Resort. Photo: Ben Girardi. 6. For more of a lodge experience – one that’s truly peaceful and secluded – rejuvenate your mind and body at the Emerald Lake Lodge hot pool. Bundle up as you race to the hot pool from your cozy cabin, tucked deep in the heart of the Canadian Rockies. 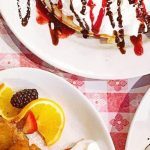 This is another great après-ski option after a day on the slopes at Lake Louise Ski Resort, which is just a short drive away. 7. Skiing or snowboarding at Sunshine Village? 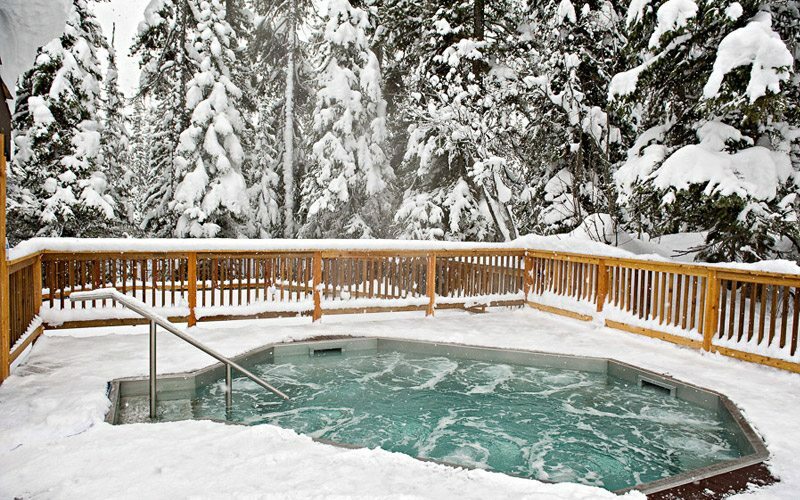 For ultimate convenience, rest your ski legs at the hot pool at the ski-in, ski-out Sunshine Mountain Lodge. The convenient slope-side location means you’ll spend more time relaxing, and less time travelling to your accommodation after a big day on the snow. Insider tip: enjoy a round of hot-tub bingo to add extra fun to your soak. For ultimate après convenience, the on-mountain Sunshine Mountain Lodge is perfect after a day at Sunshine Village Ski Resort. Photo: Liam Doran. 8. For an outstandingly family-friendly experience, escape to the Douglas Fir Resort & Chalets. While the kids enjoy the indoor waterpark, complete with two giant waterslides and a kiddie pool, or the in-hotel arcade, parents can kick back in the stunning mountain-view outdoor hot pool. Insider tip: the unique shape of the outdoor hot pool means it has many nooks and crannies – providing opportunities for more personal space. The Douglas Fir Resort & Chalets is a great choice for families. Photo: Luke Sudermann. 9. Looking for a hidden gem? Indulge your senses at the Banff Aspen Lodge‘s two hot pools – one of which is nestled alongside a super cozy and inviting fireplace. Insider tip: Banff Aspen Lodge is also home to Whitebark Café where you’ll find the best hot chocolate and coffee in town. Banff Aspen Lodge is home to two cozy outdoor hot pools. Photo: @chrisbanff on Instagram. 10. Discover the breathtaking mountain views and tranquil calm of the Hidden Ridge Resort hot pools. Overlooking the Bow River and the Banff townsite, the views are the jewels of this resort – some of the best in Banff. Insider tip: check out the cozy sauna which the resort has converted from an old shack – it’s full of character. 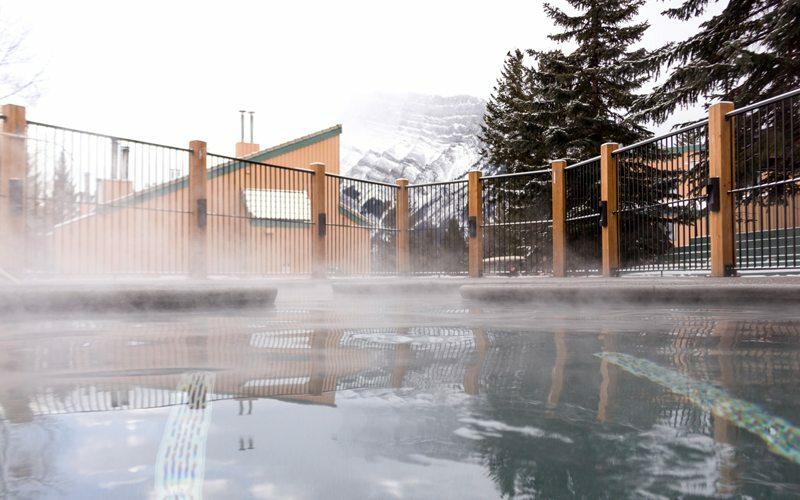 Head to the Hidden Ridge Resort hot pool for some of the best views in Banff. Photo: Expedia. Want to keep the good times rolling? After you’ve enjoyed your après-ski soak, continue the indulgence with our guide to the best comfort food in Banff and Lake Louise. Remember to tag #SkiBig3 on social media for the chance to be featured on our accounts. Are you ready for a holiday to remember? I love everything you posted. But I’m summer person. Gorgeous Rocky mountain this 2018 summer. We don’t offer summer tours although each of our ski resorts has summer sightseeing activities. All of these hot springs/pools are open year round and in the summer it’s light out much later, so the view is still there well into the evening! any natural hotsprings in the mountains And not commercial made? The Banff Upper Hotsprings as well as those in Radium and Jasper are all natural, but with infrastructure built on top of them for health and safety reasons. The hotsprings at the Cave and Basin national historical site are still in their original shape and form but are not for swimming as it is the habitat for an endangered species of snail. For something more rust you might want to look into the Lussier Hot Springs, a scenic 3 hr drive from Banff. When is the most quiet time to go? Winter is considered low season in Banff National Park, so anytime during the winter is a safe bet for quiet time, excluding holidays likes Christmas and long weekends. Mid-week skiing is always a dream! Are all of these open to the public or do you need to be staying at the hotels to use them? It is a combination of both. 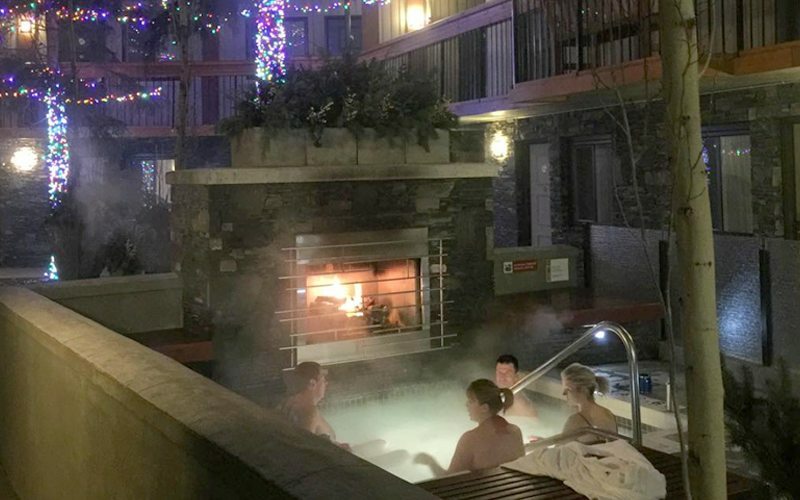 All visitors are welcome to experience the Banff Upper Hot Springs. 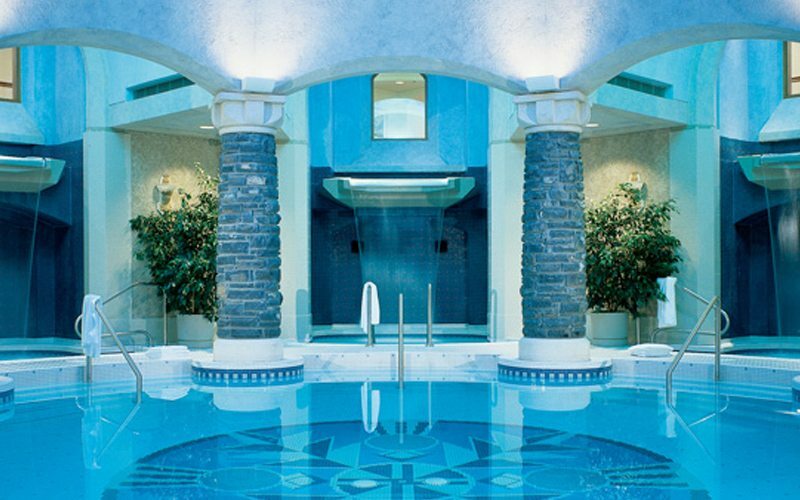 The Fairmont Banff Springs Willow Stream Spa is also open to the public with an advanced reservation. Hope that helps!